The holidays are here! It’s a time for celebration with family and friends which often means good food and good drink. 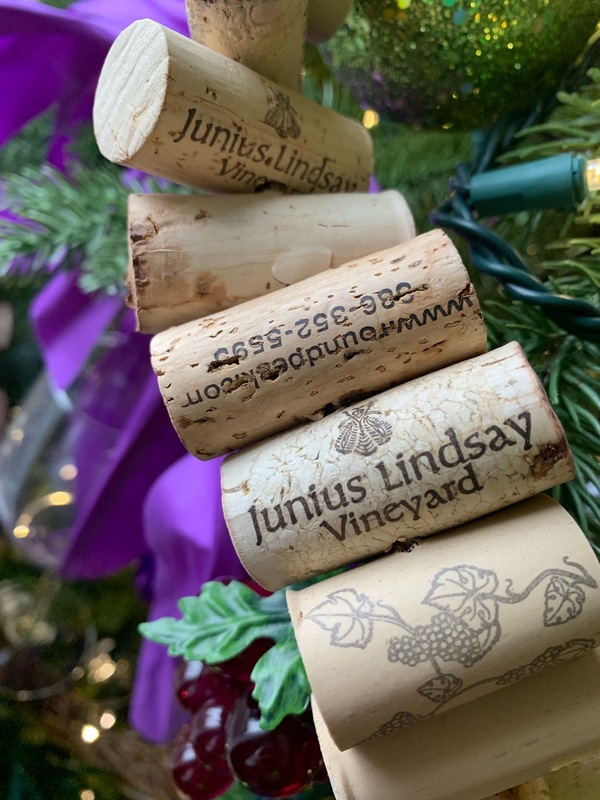 With a growing industry and higher quality of wines, it is time to consider adding North Carolina wine to your holiday table. But where do you start? What should you pair with classic holiday foods? We’re back this year with some updated suggestions! Appetizers – Start your holiday meal with an array of appetizers. What pairs best with appetizers? Sparkling wine! Sparkling wine is a versatile wine choice that pairs with just about anything. We suggest the 2015 Château Reserve Blanc de Blancs from Biltmore Estate Winery in Asheville. It’s a beautiful wine full of tropical notes with a yeasty undertone. Winter Salad with Oranges – Oranges and spicy greens are perfect this time of year. Add some feta cheese, walnuts and a tangy vinaigrette and you have magic! To further that magic, pair the salad with the 2016 Muscat Blanc from McRitchie Winery & Ciderworks in Thurmond. Made in the Alsatian style this wine is dry with notes of citrus and honeysuckle. Ham – Ham is a classic main course for any holiday. We love ham studded with cloves and topped with pineapple and brown sugar. We have two recommendations. The first is the 2015 Viognier from Junius Lindsay Vineyard in Welcome. White peach, tropical fruits and a clean, crisp finish pair beautifully with ham. The second is Christina’s Magnolia Estate from Cypress Bend Vineyards in Wagram. This dry Magnolia wine has a grassy undertone with nice citrus notes. Turkey – Roast turkey is versatile. You can pair with a white wine or a lighter red wine, but rosé is the classic pairing. This is especially true if you have your turkey with cranberry sauce. We recommend the 2017 King’s Mountain Rosé from Overmountain Vineyards in Tyron. This wine is bright and crisp with notes of strawberry, watermelon, and lime. Duck – Ah, duck! It is poultry that has the umph of a steak! Classically you would pair duck with a Pinot Noir. This year we’re going with the 2015 Cabernet Franc from Dover Vineyards in Concord. Spicy and peppery, pair this wine with duck breast seasoned with salt and pepper with an onion marmalade. Roast Beef – Roast beef is another holiday classic. Of course, this calls for a hearty red wine! We have two best in show winners for you! The first recommendation is the 2015 Double Barrel from Sanctuary Vineyards in Jarvisburg. A blend of Petit Verdot and Tannat, this wine definitely meets the qualifications of a hearty red. It wine was Best in Show at the 2018 NC Fine Wines Competition. The second recommendation is the 2013 Steel & Stone from Jones von Drehle in Thurmond. This is a blend of Petit Verdot and Cabernet Sauvignon. It’s lush and rich with notes of fig, blueberry, and blackberry and was 2018’s Bunch Grape Wine Best in Show at the NC State Fair. Seafood Lasagna, Roast Chicken or Roasted Vegetables – Any of these dishes make for a great additions to your holiday table. For pairing with all of these, we recommend the 2015 Barrel Fermented Chardonnay from Laurel Gray Vineyards in Hamptonville. This wine is oaky and buttery yet retains good fruit. Any Tomato Based Dish – Are you having a dish with tomato sauce and maybe a little spice? We recommend the 2014 Sangiovese from Piccione Vineyards in Ronda. This wine has notes of oak, caramel, vanilla, and bright red cherry with balanced acidity. Chocolate Desserts – Decadent chocolate desserts call for port-style wines. They are perfect with rich chocolate or just by themselves on a cold night. We recommend the 2013 Selfish from Lazy Elm Vineyard and Winery in Mocksville. This fortified wine is made from Cabernet Franc. It’s rich and decadent and pairs perfectly with chocolate! Pumpkin, Apple, or Pecan Pie – Fruit or nut pies pair wonderfully with white dessert wines. We recommend the 2017 Late Harvest Petit Manseng from Parker-Binns Vineyard in Mill Spring. This wine is warm and rich with notes of pear. At 18.5% alcohol, a little bit is all you need. These are our recommendations for 2018. We’d love to hear your recommendations, so leave us a comment!